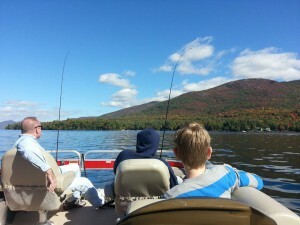 There are a few more weeks to get out and enjoy the fishing and foliage from the waters and there’s not a better way to spend an autumn afternoon than with a fishing charter or foliage cruise on Lake George. The winner of the foliage pontoon cruise was Janet Maszdzen. She’ll enjoy the lake with a few friends and you should do the same. 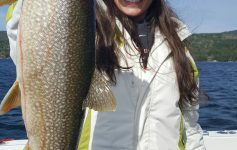 We’ve had a spectacular week aboard the Highliner – check out the lake trout, beautiful . 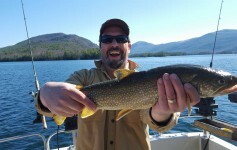 The bass are still biting too, and of course the foliage tours are more brilliant by the day. See you on the water. 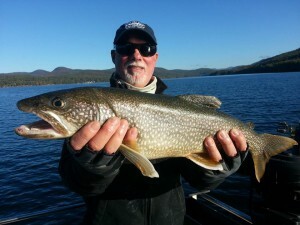 Previous Article Lake George Fishing Charters and Great September Events!